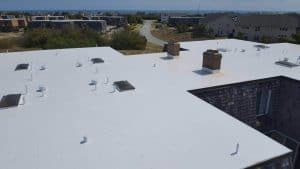 BM Roofing can handle your commercial single ply roofing needs. We have made a commitment to offer only the best manufacturers products available in the single-ply industry. And we offer the finest possible workmanship and to remain at the forefront of modern roofing solutions. Our warranties cover both workmanship and materials and are among the strongest in the industry. Contact us today for all of your commercial single ply roofing needs. Looking for a commercial & industrial single-ply roofing specialist?